Imagine you have an idea that might make you happy and successful. People will love your project and whenever someone sees you, they will shout, “Oh my god, look! Here is the founder of that amazing thing!”. However, let us snap back to reality. In order to become a well-known entrepreneur and build a successful company, you need to start from properly planning it out. Therefore, the first thing you need to do is to create a business model canvas. The Business Model Canvas tool — is what this story is all about. 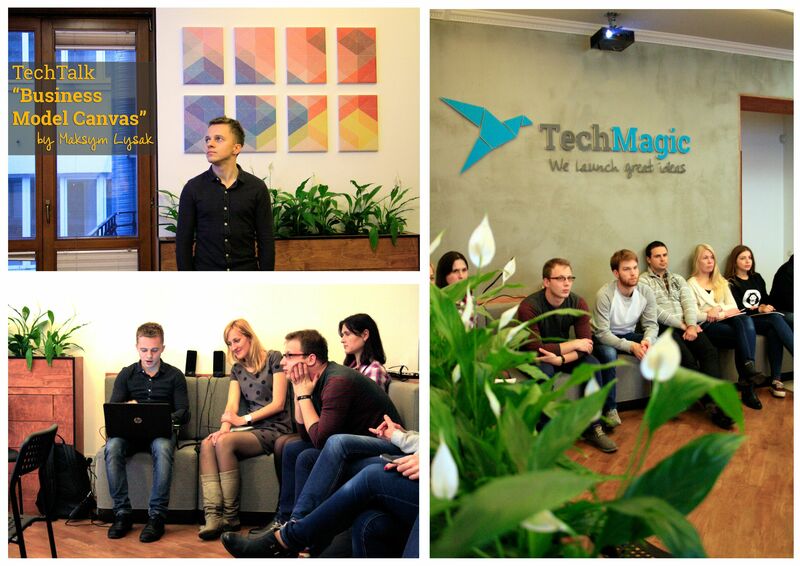 In the past year, it has become a good tradition at TechMagic to arrange Tech Talks. During these talks, we discuss IT industry news, analyze interesting projects, and share our experience. Everyone can improve their technical and software skills or come up with brand new ideas for our R&D projects. We call these events "MagicTalks". The last MagicTalk was devoted to Business Model Canvas. Maksym Lysak, the Co-Founder, and CEO of Lviv IT business incubator and Lviv Startup School, was the speaker of the event and provided us with valuable theoretical and practical information on this topic. Having great technical and software skills is as important for developers as understanding their customers’ needs. To help the team understand how a client feels about launching the product TechMagic has organized a series of seminars. We believe that it will allow us to improve our overall productivity and make our products more appealing to the end-users. Each of these nine components contains a series of hypotheses about your business model that you need to test. Shortly, the TechMagic team decided to practice more and create a hypothetical business model canvas for the Tesla company when they started working on building the electric car. In conclusion, for those, who want to learn more about this simple tool for designing innovative business models, Maksym recommended to read the following book: “Business Model Generation: A Handbook For Visionaries, Game Changers, And Challengers”. It is a practical, inspiring handbook for anyone striving to improve a business model or craft up a new one. You can buy it here. Check out photos from the event on our FB page.